Step 1 Preheat oven to 400°F. Line a baking sheet with parchment paper or lightly coat with cooking spray; set aside. For batter, in a medium bowl, stir together flour, cornmeal, sugar, baking powder, dry mustard, and salt. In a small bowl, combine milk, egg, and oil. Add milk mixture to flour mixture; mix just until combined (mixture will be thick). Step 2 Insert wooden skewers into ends of the frankfurters. Holding on to skewer, rotate each frankfurter over bowl and spread batter to coat frankfurter evenly. Place on prepared baking sheet. Bake for 14 to 16 minutes or until golden brown. If desired, serve with yellow mustard. Tip: If using sugar substitutes, choose from Splenda® Granular, Equal® Spoonful or packets, or Sweet'N Low® bulk or packets. Follow package directions to use product amount equivalent to 1 tablespoon sugar. Nutrition Facts per servings with substitute: same as below, except 181 cal., 27 g carb. 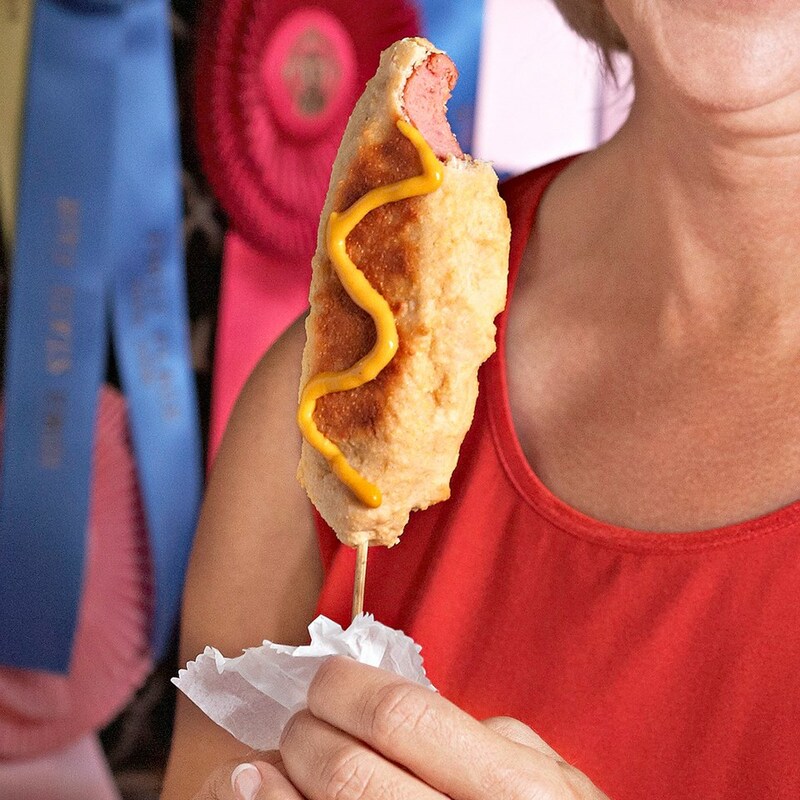 The summertime fair-food favorite is lightened up with a baked cornbread coating and is served on a stick.